• 'The Silence of Good People,' which has been inducted into the National Civil Rights Museum. Jack Chernos has busked or gigged in almost every type of venue: picket lines, police barricades, music festivals, rock clubs, churches, subways, community centers, auditoriums, trade union meetings, government buildings, from flatbed trucks, and in corporate and pirate radio stations. From San Francisco’s Paradise Lounge to Manhattan’s Arlenes Grocery to the University of Nuremberg, Jack has been there with his small amp and large songs. He's been booed off a stage in Nashville, been arrested at machine gun-point for attempting to perform for a particularly unreceptive audience, and played for crowds of tens of thousands. Jack plays keyboards, guitar, lap steel, bass, trumpet, saxophone, and harmonica. But three years ago he picked up a banjo and realized banjo is the instrument he was born to play. 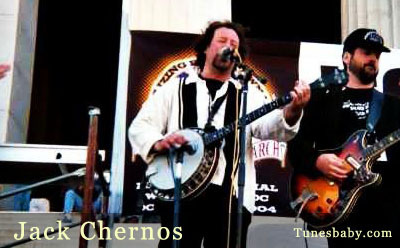 Within six weeks he was gigging on banjo, and eight months later he received an endorsement deal from Deering Banjo Co. This singularly American instrument has been instrumental in the development of his unique style of music: punk/folk banjo.